FREDERICTON – The provincial government released today a new pension model developed by the Task Force on Protecting Pensions in collaboration with a number of union leaders. The model has received support from several public and private sector plan sponsors, including unions and the provincial government. "A number of pension plans in New Brunswick and across North America are facing significant funding deficit issues,” said Premier David Alward. “This model, developed in collaboration with union leadership, offers an innovative way to address those issues before it is too late. This model achieves our goal of making pensions in New Brunswick more secure, sustainable and affordable." The task force, appointed by Justice Minister and Attorney General Marie-Claude Blais and Finance Minister Blaine Higgs, was mandated to examine the long-term stability and security of pensions in New Brunswick. ● the plans must be fair to employees at all stages of their career as well as to retirees. The New Brunswick model is based on a well-established Dutch model. Both jurisdictions face similar economic and demographic challenges, including an aging population, growing life expectancy and market returns that are not keeping pace with payouts and indexing. “One of the strengths of this model is that it can be adapted to different public and private sector plans. We encourage those plans not currently involved to engage in a similar collaborative process with the task force to see how they, too, might benefit from such changes," said Alward. As a demonstration of this collaboration, it was announced by the New Brunswick Nurses Union, the New Brunswick Union, the Canadian Union of Public Employees (CUPE) Local 1252 (New Brunswick Council of Hospital Unions) and the New Brunswick Pipe Trades that they will be adopting the new model for specific plans. These are the CUPE Hospital Plan; the Pension Plan for Certain Bargaining Employees (CBE) of New Brunswick Hospitals (the New Brunswick Nurses Union and the New Brunswick Union) and the New Brunswick Pipe Trades Pension Plan. "I am pleased to have been part of the building of the required solution for the issues in the CBE Plan, and I am confident that the new model will address those," said Susie Proulx-Daigle, president of the New Brunswick Union. "I look forward to the same consultative and collaborative process for the other plans in which our members participate." "We are pleased with the collaborative effort to put these changes into place,” said Gary Ritchie, administrator of the New Brunswick Pipe Trades pension plan. “The new rules will allow us to recognize the advantages that our plan provides by being one of the few pension plans in Canada to be more than 100-per-cent funded on a going-concern basis. And that is what these changes will allow our plan to remain – a going concern – thanks to these new flexible rules designed for today. These rules will provide our plan members with the security and benefit levels they deserve, while providing the sustainability and affordability that the plan's sponsors require in an increasingly competitive global environment." "I am pleased to have a new pension plan model that will address our pension issues with which we have dealt for several years,” said Norma Robinson, president of the New Brunswick Council of Hospital Unions, CUPE Local 1252. “Having our CUPE pension specialist involved from the beginning ensures that the best interests of our active members and retirees have been protected through this process. This new plan will assure security, sustainability and affordability for the members who will retire in the future." 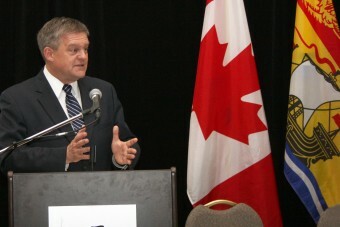 "As premier, I will be advocating this model for our own pensions,” said Alward. Blais indicated that amendments will be made to the Pensions Benefit Act in the near future to allow both private and public sector pension plans the option to adopt this model if they so choose. ● Addresses demographic challenges that make the current system unsustainable, including fewer people working and a larger number of retirees who are living longer. ● Updates a pension system that was designed for 1980s economic and demographic realities. ● New system is safer and more secure in that it discourages riskier investment practices as a means of recovering losses and has built-in flexibility to better absorb declines in the markets. ● Was developed collaboratively with union leadership by pension plan experts. ● Based on the successful Dutch model, which applies proven risk management methods to pension plans. ● Ensures that public sector pensions are affordable for taxpayers in the long run. ● No decrease to the benefit level currently in place for retirees. ● Likely to result in marginal increased contributions. ● Moves toward plans based on enhanced career-average earnings, rather than final salary. ● Moving targeted year of retirement from 60 to 65 but implemented during a 40-year period. ● Cost of living increases will be conditional on plan performance. However, when pensions are in surplus position, there is an opportunity to reinstate years when cost of living increases were not provided. ● All changes are incremental and on a go-forward basis. ● Ensures that pensions will be secure for many years to come.